The Religious Studies Department mirrors the Dominican tradition of Veritas and the mission of the high school in providing a holistic curriculum which explores and celebrates the unique gifts of each young woman. The goals of the department include providing an age-appropriate introduction to the theological, ideological and historical dimensions of the Catholic Christian religion, a recognition and celebration of the interdependence and interaction of a wide variety of religious traditions, and full individual appreciation of and participation in, a real, lived faith. The scope and sequence of classes build on the wisdom and growing maturity of each grade level, clarifying Catholic teachings and traditions in relation to each course and stressing a wider application of social justice and shared faith. Starting in ninth grade with an “Introduction to Catholic Christianity and Personal Spirituality” and ending in senior year with “Women’s Spirituality,” classes challenge the student to recognize and develop her own faith journey within the parameters of her own religious tradition while continuing to appreciate the spiritual and liturgical dimensions of participation in a Catholic private high school. 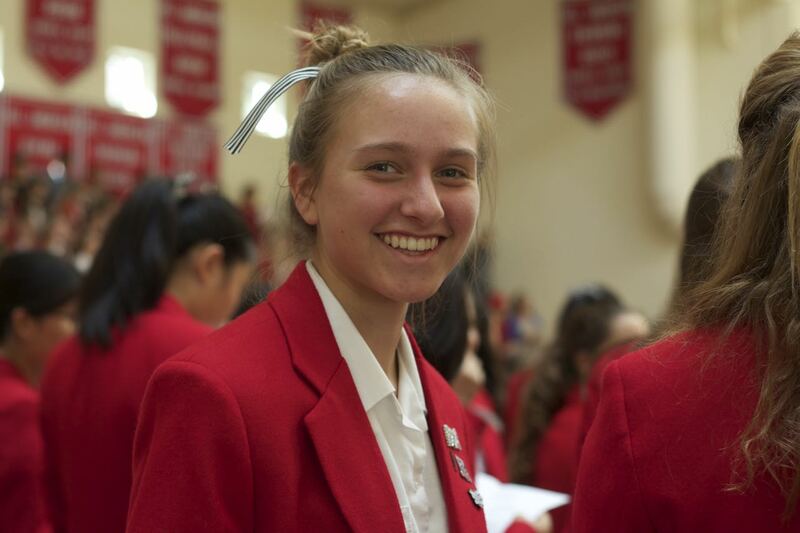 Flintridge Sacred Heart Academy strives to meet the unique needs of our culturally and religiously diverse student body while at the same time ensuring that we are in alignment with the curriculum set by the United States Conference of Catholic Bishops. This course is designed to embrace the diversity of the student community while examining the sources, teaching and vision of Catholic Christianity especially as it relates to students entering an unfamiliar environment. Basic Catholic theology is introduced within the context of Hebrew Scriptures, Judaic roots, Christian Scriptures and Catholic Tradition. Running parallel through the course is the recognition of a universal call to holiness. This theme invites each student to participate fully in her own journey by examining components of emerging spirituality and personally experienced faith. The relationship between faith and practice is an ongoing conversation as students begin to identify and recognize the complexity of their own religious identities. This course will introduce students to the Catholic Church as both institution and community. The students will leave the course with an understanding of the structure of the Church, its leadership, and the role of the laity. Additionally, students will examine closely their local Church, the Church of Los Angeles, and the many ways that over 4,000,000 Catholics in 287 parishes speaking 42 languages profess and express their faith. World Religions is an introduction to the academic study of religion and of various religions of the world. We first look at primal or “oral” religious traditions that came out of Australia, Africa, North and Central America. Next, we study the major religious traditions in detail: Hinduism, Islam, Judaism, Buddhism, Sikhism, and Jainism. Students will engage in a research project to examine other religious traditions: the Amish, the Mormons, the Quakers, the Rastafarians, Taoism, Shinto, Zoroastrianism, etc. The course, in general, examines the historical evolution, the fundamental doctrines and beliefs, the practices, institutions and cultural expressions of these religious traditions. The study also points to the uniqueness of each religious tradition by studying some of the essential similarities and differences between them. In their Old Testament course, students will survey the major books of the Hebrew Scriptures while examining the historical and cultural contexts in which they were written. The course is designed to introduce students to the literature, history, and messages of the Old Testament and allow them an opportunity to familiarize themselves with its books, major events, and people. Students will learn to identify the various genres of literature present and recognize the overarching themes of creation, self-revelation of God, liberation, and covenant. Students will examine the ways in which these scriptures have helped to shape Western culture and the myriad lessons and truths they hold for contemporary believers. Introduction to Christian Scriptures will give the students an opportunity to explore the Gospels, Acts, epistles, and Book of Revelation through both an academic and spiritual lens. The course will introduce forms of biblical criticism and will challenge the students to understand the New Testament’s teachings as they apply to our everyday lived experiences. We will study scripture in light of Jesus’ call for outreach to and justice for the oppressed and marginalized. The Social Justice and Morality course will provide students with an opportunity to explore and discuss contemporary issues through the lens of the Gospel values of liberation, compassion, mercy and love. Using the Seven Principles of Catholic Social Teaching and the 10 Commandments as our primary framework, we will explore the underlying causes of structural and social injustice and wrestle with the major ethical questions of our modern world. We will cover racism, sexism and gender related issues, classism and economic disparity, war and violence, beginning and end of life issues, access to health care, prison reform, immigration, medical and bio-ethical issues, and care for creation. By learning about these issues through a Catholic lens, students will learn to develop right conscience and Veritas in concrete ways that can be applied to their daily lives. This course will allow students to explore the thoughts and writings of some of the most important and influential women in Church history. The class will cover a wide range of historical women from the Hebrew Scriptures, Christian Scriptures, the early Church, Middle Ages, Renaissance, Enlightenment, and into the 21st century. The course will also include units on Mariology and the theologies of women of color. Vocations and Sacraments is the final course in the four-year comprehensive Religious Studies curriculum at FSHA. In this course students will take time to consider the questions “Who am I?”, “Who does God want me to be?”, and “What does it mean to live a sacramental life?” Through the writings of major Christian thinkers including Thomas Merton and Henri Nouwen, contemporary and the documents of the USCCB, students will be introduced to the process of discernment and the concepts of vocation or calling and developing a sacramental understanding of the world around them. The Christian Service Program requires all students to complete a minimum of 15 hours of service per year. In order to fulfill the requirements of the Christian Service Program, students may donate their time to one-on-one service to the elderly, poor, sick, lonely, disadvantaged, rejected, impassioned, physically, emotionally, abused, or psychologically challenged persons. The liturgical ministries of lector, altar server, or cantor may constitute no more then one-third of a student's total hours. A maximum of five of the fifteen hours may be for FSHA, for such events as GALA. When Flintridge Sacred Heart Academy‘s religion department announced that a trip to Italy was in the works, I immediately signed my daughter Hannah up. Now mind you, she was an incoming freshman, and I knew I would hear, “I am not going if none of my friends are going.” Sure enough, she said exactly that when I told her, but I started paying for her trip. Then I thought, “Now how can I get on this trip?” since it was not open to parents or even other faculty members. Perhaps they would like to have the school nurse as a chaperone? … I was beyond excited when Sr. Mary Therese Perez (a.k.a. Hermana) came to me and said they would like me to attend. This would be a trip of a lifetime! ‘Pasqua Italiana: Through Dominican Eyes.’ A Dominican Pilgrimage. Holy week in Rome. A Papal Audience. Walking in the steps of St. Francis and St. Dominic. Easter Sunday mass at a chapel built on the site of St. Catherine of Sienna, a Dominican. Could there be anything greater than experiencing this with the young ladies of FSHA and my daughter Hannah? 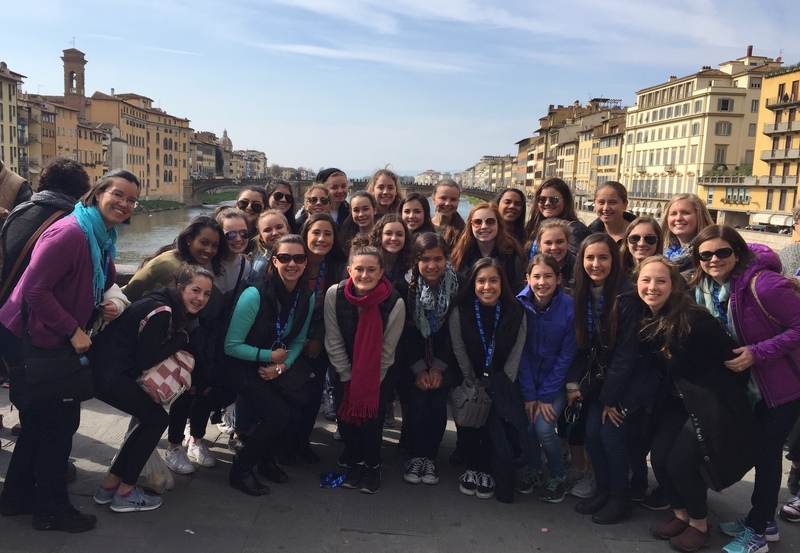 Read all about Michele's trip to Italy with her daughter and FSHA's relgion department. Starting something new is always hard, but entering into the unknown realm of a new school year can be even harder. Before I started my journey at FSHA, I was excited, scared, and anxious. After reading “Tattoos on the Heart,” I realized I wasn’t alone when I felt these feelings. Marta on campus at FSHA reflects on her reading of Father Greg Boyle's "Tatoos on the Heart"
A major theme in “Tattoos on the Heart” is change. With the help of Father G, homies decide that they want to change and become better people. The process of change is hard. Homies feel nervous, afraid, thrilled and ready to start a new chapter in their lives. This is exactly how I felt starting high school. It was a mix of emotions, and didn’t know which one to feel. Reading Father G’s book let me connect and understand with what the homies were feeling. Continue reading Marta's reflection, plus those of other students in FSHA's religion class. University of California, Los Angeles - M.A. Universita Pontificia Salesiana - B.Div. Loyola University of Chicago - M.A.